My flight from Chicago arrived nearly an hour late, but it was still early by Spanish standards (before 9 AM). It seemed to take at least 30 minutes to exit the gate and terminal and get out to some cool, fresh air. This was likely quite true as I found out on my return to the airport. Madrid’s Barajas Airport is very spread out, and most flights from the U.S. arrive at Terminal 4S, which is literally miles from the other terminals. Before I left, I had researched how to get from the airport to the city center on public transit. The Madrid Transit System recently started a new service: the airport express bus. Thank goodness for this efficient, cost-saving service! I had exchanged money to have a few euros when I landed, so I had the 2 € coin in hand for the bus driver. Once on the bus, I was happy to discover that it also had free WiFi. The bus terminated at Atocha train station, which was about a six-block walk from my Madrid accommodations: Hostal Gonzalo. While trekking to the hotel, consulting a free map picked up at the airport tourist information booth I turned a corner and saw a long line of people on the street. As I got closer to my hostal, I had to literally struggle my way through an increasing glut of people who were trying to access a church at the end of the same block my hostal was on. While I checked in, the proprietor tried explaining to me that there was something special about the date and visiting this church, but I really didn’t understand it. After an eight-hour flight and maybe two hours of sleep, I was tired and glad to lay down for about an hour. Then I headed out to do some more business tasks. I needed to get more cash from an ATM and pick up a SIM chip for the unlocked mobile phone I had brought with me from the U.S. (borrowed from a friend in the biz…thanks, R!) 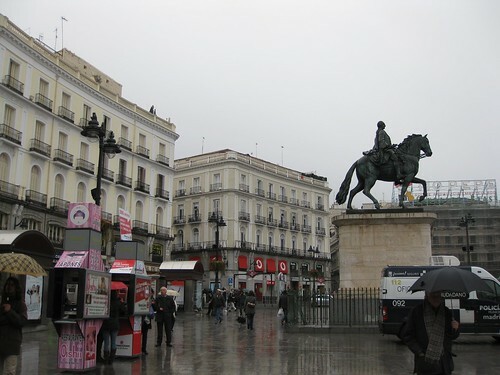 So I headed out on foot towards Puerta del Sol, considered the center of Spain. I stopped at the first ATM I encountered: a Servi-Caixa machine. I was disappointed when it notified me that an additional 3€ charge would be levied for me to use the machine. According to my research, ATMs were largely fee-free in Europe, yet here I was being charged! Happily I found this an anomaly; there were a few ATMs that charged for use, but once I saw a screen notifying me of the fee, I would cancel the transaction and then walk a bit further (no more than a block usually) to use a fee-free ATM. As I arrived at Sol, I was dazed by the plaza around me and dodging sprinkling rain. While at Sol — which was a major transportation hub — I also purchased a 10-ride ticket for the Madrid public transit system for about 10€. I had to pay cash for the ticket since neither my credit nor my debit cards would work in the machines. I used my ticket that same evening as I rode the 27 bus up Paseo del Prado to the Madrid Knitters Night. When visiting a strange city, it is a comfort to find others with whom you can connect. Every time I travel for pleasure, I try to find a knitting group meeting and/or visit yarn stores. People who share your interests are usually very welcoming and this group was no exception. There were a few ex-pats in the group, so I had no trouble communicating with my limited Spanish. 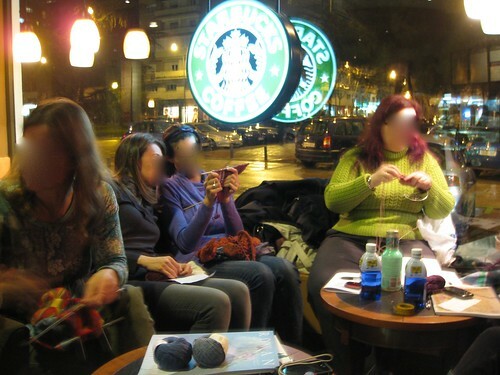 The knitters helped me stay awake and engaged on this day where I was tired and jet-lagged. They also helped me with a pesky problem I had been trying to tackle. I had been looking for a power strip to purchase, and it was here I learned that a power strip was called a ladron (thief) and that I was likely to find one in a ferreteria (hardware store) or a chino (a small, neighborhood store typically run by Asians, hence the slang name). I bought a sandwich at Starbucks to eat in my room for dinner, then left the knitting group about 30 minutes early and made my way back to the hostal. (Passing by lines of people still waiting to get into the church!) I ate my sandwich as I used the WiFi in my hostal to call B on Skype, then went to bed. On this first day in Spain, I was tired and lacking confidence in my communication skills. I did OK, though, thanks to the kind people at my hostal and the knitters. Hola! Estoy en Granada ahora. That’s Granada as in Spain. After months of researching and talking about wanting to go to Spain, here I am! This is a big deal to me. I’ve been diligently putting aside money in a targeted savings account every month for a year because I knew I wanted to travel. I just wanted to go so many places it was hard to make up my mind. Finally, late last Fall it came to me: Spain. Apparently the feeling is floating around with a lot of folks. Some friends of mine will be here in Andalucia next month, in fact. I’m traveling on my own and it’s been a bit tricky. My Spanish is rudimentary and rusty. It’s starting to come back a bit, but I’m so shy to speak. Only now — four days into the trip — am I starting to feel willing and able to stutter out abbreviated phrases using abysmal grammar. At least I’m trying, right? I’ve been staying connected via WiFi in my accommodations. I carefully chose places that included it in the amenities. I haven’t been blogging, though, because as much as I love my little tablet (a “rooted” NookColor) the lack of a qwerty keyboard is a challenge for me. Traveling alone is lonely at night. I suspected it would be, but I decided to not put off the trip for that single reason. I hoped that I would meet others to talk with, and I have. But I don’t get to converse with people every night and I’m always dining by myself. Spaniards aren’t necessarily stand-offish, but they have their own lives and aren’t here just to amuse me. The language barrier and my general tonguetied-ness hasn’t helped. But I’m here. That’s what is important. I’m eating typical Spanish food (not a lot of veggies, unfortunately) and drinking Spanish wine and beer. I’ve adjusted to the Spanish dining schedule which involves light breakfasts, mid-morning snacks, sizable lunches at around 2PM (that’s 14:00 hora here) and more snack-sized bites in the evening. This eating schedule really works for me (although the small amount of vegetables does not). So far I’ve stayed in Madrid and for the next few nights I’m in Granada. I visited Toledo yesterday (a day trip) and move on to Sevilla in a few days. There’s much too much to see and do, so I’ve just resolved to use the same approach to touring Spain as the Spanish do with eating: small bites here and there keep you satisficed. And this, too, works for me. Over the past few days I’ve found myself avoiding my house. Mark has been on holiday from work for the past 2 weeks and it seems like all he does is sit in the dining room on his laptop or in front of his desktop downloading podcasts. He is constantly around, only occasionally leaving the house to go to the gym. It’s driving me nuts. So, here I sit in a Panera sucking up free WiFi along with a coffee and dreading the eventual return home. It’s Saturday and I’m desperately hoping he will find some reason to leave the house because I just want to relax in my own home. By myself. Alone. I’ve never had a problem living alone and I’m quite looking forward to it in many ways. It really irks me that I cannot get some space to myself for the foreseeable future; that I must continue to daily see and interact with this person who has betrayed my trust and caused me heartache. I think my lawyer must be sick of me asking over and over: when will this be over? By that I mean: when will I be able to stop sharing my living space with this traitor. During the evening, I knit a dishcloth for my mom. This is the second one I’ve made her in just a few days and I will be making several more. It was quite embarrassing on Christmas day to see the state of the cloths she is using to wash her dishes. As a knitter, I just had to jump into action and so I’ve picked up a bunch of Lily Sugar n’ Cream and am completing a dishcloth a day. It’s sort of like revisiting my single, pre-Mark years to be working on dishcloths again. When I first started knitting, I was frustrated by how long it took me to work on the sweater I so desperately wanted. So, Adrienne — the person who so competently taught me how to knit — suggested that I put the sweater down for a bit and try to knit a few discloths. My first dishcloths seemed to go incredibly slowly, too. Like many new knitters I knit very, very tightly and at times had trouble even getting the needle into a stitch. So when I cast on for a dishcloth on new year’s eve at Adrienne’s house, I couldn’t help but be amazed at how much looser my gauge has become. It’s nice to see that some progress is being made in my life over the past few years. I’ve certainly become a much better knitter! One of the things I’ve been doing today while sitting in this Panera is catching up on all the blogs I subscribe to in my Google Reader. There are some, like Lifehacker, which it seems I can never catch up with. But many of the blogs I read are ones written by just regular folks I’ve stumbed across somehow, like The Stitch Witch, or folks who are part of the knit-blogger community. Crazy Aunt Purl may not write about knitting that much, but I’m finding that I can really, really relate to her these days, and her new year post is so outstanding. Go over there and read it. I think her resolutions exactly fit me, too. I will listen to my instincts. I will try really hard to stop doubting myself so much. I will keep on a solid financial course. And, finally, I will TRAVEL! I am intrigued to travel to the following places and will find some way to do so in the next 3-5 years: Spain, Portugal, UK, Iceland, and Japan. Iceland is supposed to be a fabulous deal now and I’ve always wanted to go on a horse-back riding trip there on those special Icelandic horses with a fifth gait. So, perhaps my first real action should be to sign up for horseback riding lessons to refresh my skills and get used to riding regularly. That would be a good first step towards what could be a summer trip to a land where the sun never sets in the warm months.